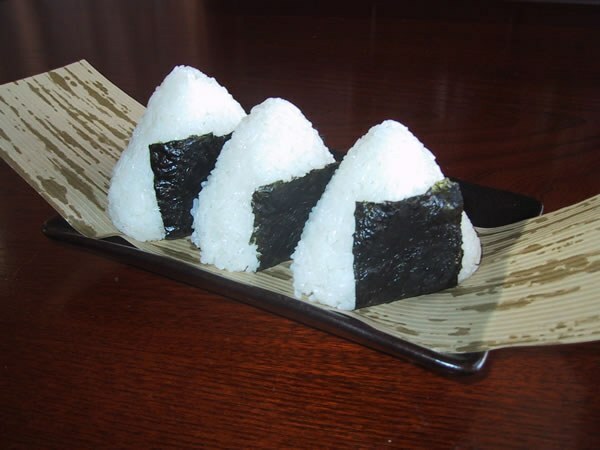 Onigiri (or omusubi) is one of the popular traditional Japanese food with an ancient history. Onigiri for the first time mentioned in connection with military campaigns in the Heian period, they were prepared for the soldiers, so they can eat them on the go. And it was really comfortable and not interfere with the movement, because this eating was like small sandwiches or cakes. The Japanese and today they love to snack, and not only they: how to cook rice balls in our days know on many continents. Instead of salmon you can use any other fish (salted, smoked, pickled) and not even necessarily the fish, and the products more familiar to Russian cuisine – cooked chicken, browned ground meat, mushrooms, etc. Rinse the rice. Make it longer, so he managed to gain enough moisture. Put washed rice in a pan (cast iron is ideal, or with a double bottom), cover with water and place on high heat. Cover do not close. Once it boils, reduce the heat to low and simmer, stirring occasionally, 15 minutes. After that, remove from heat, cover the pan with a clean towel, cover and leave for 10 minutes. Attention! traditionally rice for the rice balls should be prepared without salt. If you do not agree with this option, you can add salt to taste, or when filing on the table to put next to the soy sauce. Once the rice has cooled down a bit, reconnect the vinegar and mix well. Next, moisten hands in cold water, RUB in the palms of a small amount of salt and start making preparations for a rice ball. First, form the hands of a small ball, and then compress it with palms from all sides, ensuring that it became dense and falling apart. Thus shape balls from the just cooked rice. Next stage. With your finger make a well in each ball recess for the filling and start to fill them in salmon, pre-sliced with a knife into small pieces. Top of the filling put half a tea spoon of the rice and press it so that it stuck to the ball, covering the filling, but while maintaining its integrity. To the basic filling you can add optional chopped herbs or spices. Put some lemon or sour plum. Conformed with your taste and culinary preferences of those for whom cooking. Then take a nori sheet and cut the required size rectangles, wrap them (rough side inside) rice cakes, lightly pressing down with your fingers so that the seaweed is well bonded. By the way, onigiri comes from the word "nigeru", which means "to compress". Thus, the name of the dish exactly matches the cooking process. The rice balls are ready serve with soy sauce, wasabi, pickled ginger and tempura – fried vegetables or seafood. The Japanese love to onigiri on the table was a plum wine, sake or beer.